Sperm preparation in washing buffers is a very important step in maintaining the correct physiological activities of cells. The procedure widely adopted to assess cell viability is normally restricted to evaluation of flagellum motility/hyperactivation, a parameter which is insufficient for sperm characterization. Recent studies emphasized the importance of the evaluation of novel parameters, such as biochemical analysis of the endogenous content of reactive oxygen species (ROS) and the level of Tyr-phosphorylation of the cells, as mostly efficacy features depicting the correct status of sperm. (Donà et al., 2011). In fact, only when the above mechanisms are correctly satisfied, sperm may be considered capacitated and can undergo acrosome reaction. Capacitation is a set of alterations leading to the acrosome reaction (AR), an exocytotic process mediated by hydrolytic enzymes (e.g acrosin) that are released to allow sperm to fertilize the oocyte. What is to be underlined is that one of the most delicate step in the ART procedure is represented by the correct sperm preparation, including initial washing and final incubation leading to the precious achievement of the capacitated status. A recent study (Andrisani et al, 2014.) compared the effect of different commercial buffers according to their capacity to induce ROS production, the Tyr-P of the head and consequently, AR, paying particular attention to the cell survival at the end of 2h incubation. Interestingly, PSW-Nidacon was by far the best medium for sperm preparation: in fact, cells reaching the AR (67.2±7.9%) was almost three-five fold compared with results obtained with other commercial buffers. PSW-Nidacon also preserved cells from apoptosis (only 3.5±1.4% of total cells were not viable) compared with the great number observed with the other ones (Fig. 1). 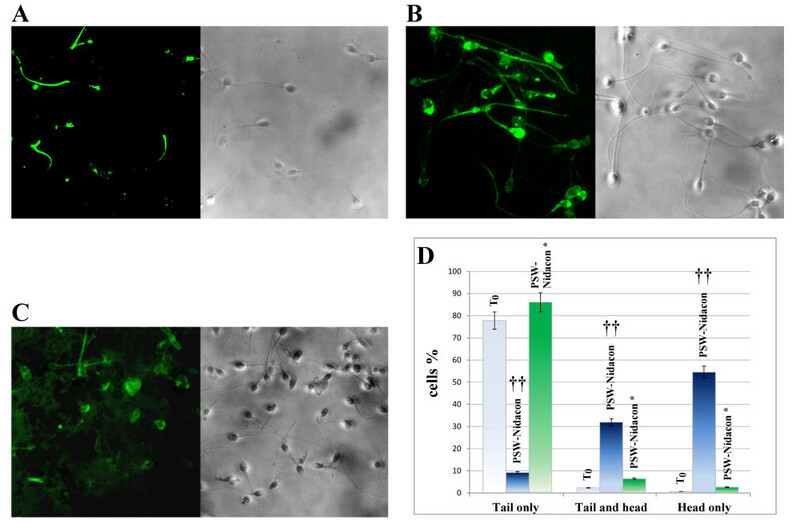 Sperm, incubated for 180 min in capacitating conditions in different buffers, were analysed for Tyr-P pattern, AR and viability (NVC) by immunofluorescence cytochemistry as described in Methods. Number of cells expressed as % of the total amount of cells showing Tyr-P in any part of the cell-body, or in the head, were detected and reported as Tyr-P cells and Tyr-P head, respectively. Percentage of cells undergoing acrosome reaction or not viable cells (AR and NVC, respectively) were also reported. Spontaneous AR percentages were also evaluated in each sample in the absence of A23187 and values reported (SAR). **p<0.0001 and *p<0.02, comparing each sample against T0 (ANOVA followed by Dunnett’s post hoc test). Values are expressed as the mean ±SD. The study also addressed the well-known problem on how buffers must be stored, since human serum albumin, glucose, lactate etc. promote bacterial/fungal contamination, thus resulting in increased buffer ROS production with a consequent fast sperm denaturation and inability to reach the capacitated state. Capacitation implies marked reorganization of membrane architecture, due to the activity of extracellular proteins which have the task of extracting cholesterol and reorganizing membrane in specialized microdomains, also called rafts, capable of remodelling and reorganizing themselves to undergo acrosome reaction. Once capacitation has occurred, these rafts migrate from the flagellum, where they are found extensively, to the peri-acrosomal region where they presumably allow interaction with the oocyte . The buffers used in the ART for sperm preparation must induce optimal conditions to achieve AR, an, once more, PSW clearly showed the best membrane reorganization to achieve the potential AR (Fig. 2). PSW-Nidacon is an optimal sperm medium to prepare sperm to undergo the potential successive AR. And to prevent time-dependent denaturation. In order to avoid any complications, it is recommendable to use fresh buffer avoiding prolonged storage. Sperms, incubated for up to 180 min in capacitating conditions in different buffers, were analysed for CTB labeling by immunofluorescence cytochemistry A) T0, control non-capacitated cells; sperm incubated in B) PSW-Nidacon ; C) PSW-Nidacon* D) Number of cells expressed as % of the total amount of cells showing CTB labeling in flagellum, head, or both as transient conditions, were detected and reported. †† p<0.0001 and †p<0.02, comparing each sample against T0 (ANOVA). Values are expressed as the mean ±SD. Donà G, Fiore C, Andrisani A, Ambrosini G, Brunati A, Ragazzi E, Armanini D, Bordin L, Clari G.Evaluation of correct endogenous reactive oxygen species content for human sperm capacitation and involvement of the NADPH oxidase system.Hum Reprod. 2011;26(12):3264-73. Donà G, Fiore C, Tibaldi E, Frezzato F, Andrisani A, Ambrosini G, Fiorentin D, Armanini D, Bordin L, Clari G.Endogenous reactive oxygen species content and modulation of tyrosine phosphorylation during sperm capacitation.Int J Androl. 2011;34(5):411-9.